Maddie on Things – Theron documents Maddie, his coonhound, on things in delightful ways with beautiful imagery. I look forward to his posts and to see what Maddie is currently on. Can we please talk about how cute she is?? 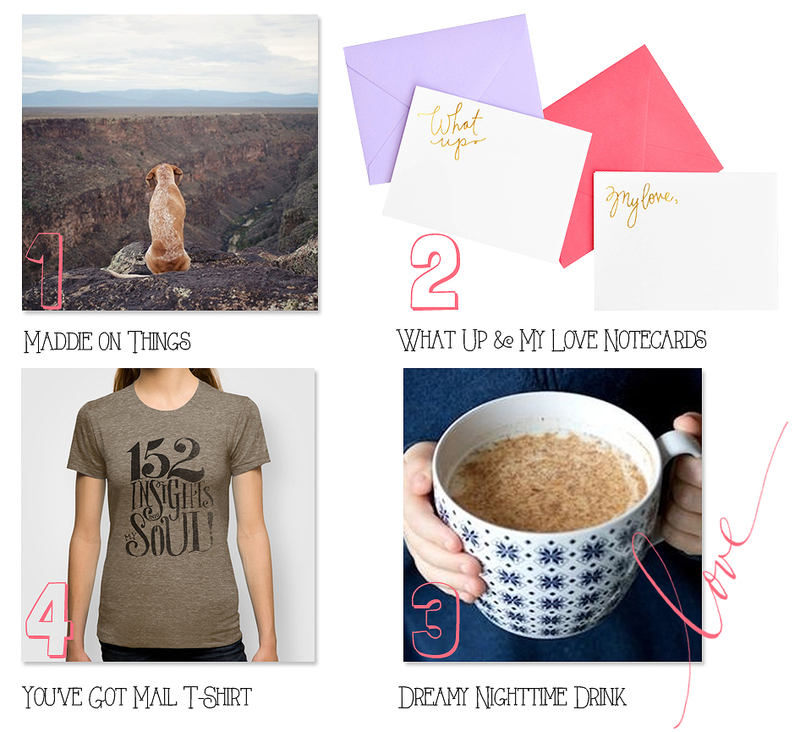 What Up and My Love Notecard Set from Leif – I love the simple gold lettering and bright envelopes. These notecards are perfect for a quick note to a friend or love. Dreamy Nighttime Drink – Tried this and really enjoyed the creamy goodness without the caffeine from a latte or tea at night. This is the perfect drink to have cuddled up with a book on a rainy afternoon or evening. 152 Insights Into My Soul T-Shirt – Do I really need to explain this one? You’ve Got Mail is one of my favorite movies so when I saw this shirt I had to chuckle….love the scene this quote is from. If you haven’t seen the movie, you know who I’m talking to, you seriously need to watch it. They don’t make romantic comedies like this anymore.